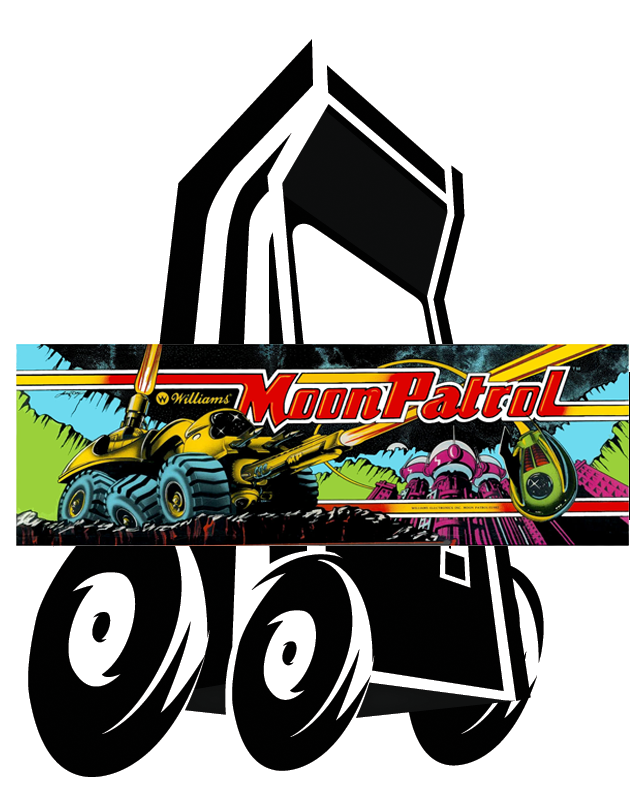 An incredible thing happens when a person takes control of Williams Moon Patrol… He can’t let go! Some say it's the striking realism and perspective of the screen graphics that keep a player strapped to the controls. The realism that puts the entire responsibility for the safety of the planet on his shoulders. Others say it's the intense action. The alien attack from overhead that takes on 3 deadly forms and that keeps the player’s finger hot on the trigger, simultaneously firing missiles straight up at the UFOs and straight ahead to disintegrate obstacles. The bottomless craters waiting to swallow him up, the boulders and rolling stones in his path, the land mines, the cannons, the erupting volcanoes, the low-flying planes on his tale that keep him alert and ready to manipulate the jump button and speed control. The clock ticking away precious seconds in a race against time and space as he makes his way from point to point along the constantly changing and challenging course plotted on the radar screen. The incentive of making better time to earn bonus points of scoring high to earn extra Patrol Cars; of completing the beginner course to be awarded the more difficult champion course and of completing the champion for another opportunity to better time and skill. H: 71", W: 26", D: 35"